Duchess Kate: The Duchess of Cambridge in Catherine Walker for Trooping the Colour & A Surprise Prince George Appearance! The Duchess of Cambridge in Catherine Walker for Trooping the Colour & A Surprise Prince George Appearance! It was a splendid morning filled with tradition, pomp and pageantry for this year's Trooping the Colour - the Queen's annual birthday parade. Trooping the Colour is always a special day on the royal calendar - and even more so this year - as it marked the Duchess of Cambridge's first official appearance since the birth of Princess Charlotte six weeks ago. The Duchess travelled in the horse-drawn No 1 Barouche carriage with Prince Harry and the Duchess of Cornwall for the ceremony. The group waved and smiled at well-wishers. Although the Queen's birthday is 21 April, it has long been tradition to celebrate the Sovereign's birthday publicly on a day in June, when good weather is more likely. Her Majesty has attended Trooping the Colour every year since 1947 except in 1955 when a national rail strike cancelled the event. 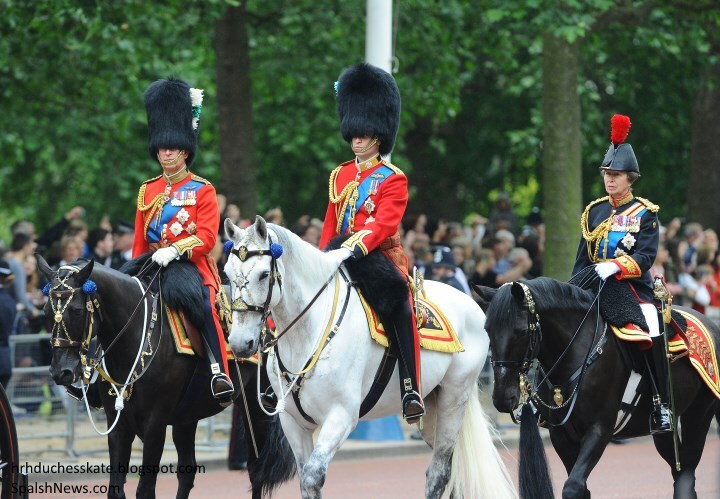 On horseback were Prince William, who is Colonel of the Irish Guards, Prince Charles, Colonel of the Welsh Guards, and the Princess Royal, Colonel of the Blues and Royals. They rode on aptly named horses - Wellesley, George and Elizabeth. The background of the prestigious annual event? 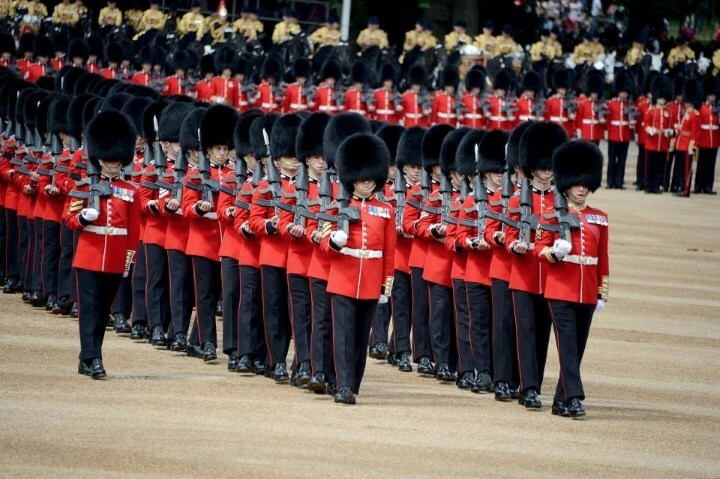 Trooping the Colour actually originated from traditional preparations for battle. Colours, or flags were trooped down the rank so it could be seen by the soldiers. In 1748, it was announced the parade would also mark the Sovereign's official birthday. 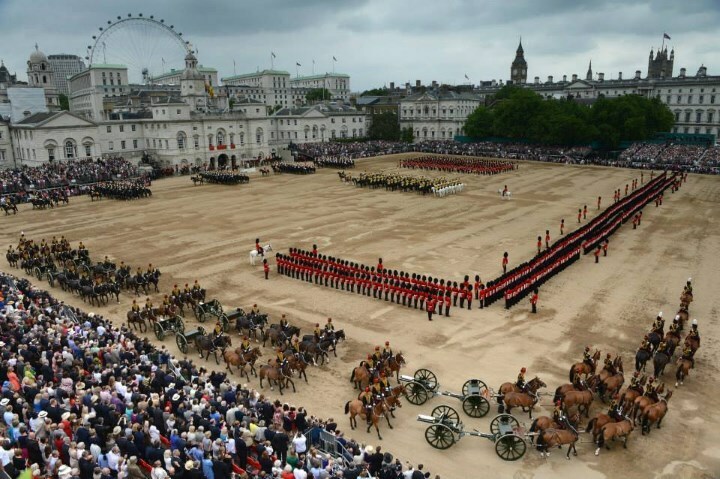 The event was meticulously planned with over 1,400 officers and men on parade, together with two hundred horses; over four hundred musicians from ten bands and corps of drums marched and played as one. Some 113 words of command are given by the officer in command of the parade. The parade route extends from Buckingham Palace along the Mall to the Horse Guards Parade, Whitehall and back again. 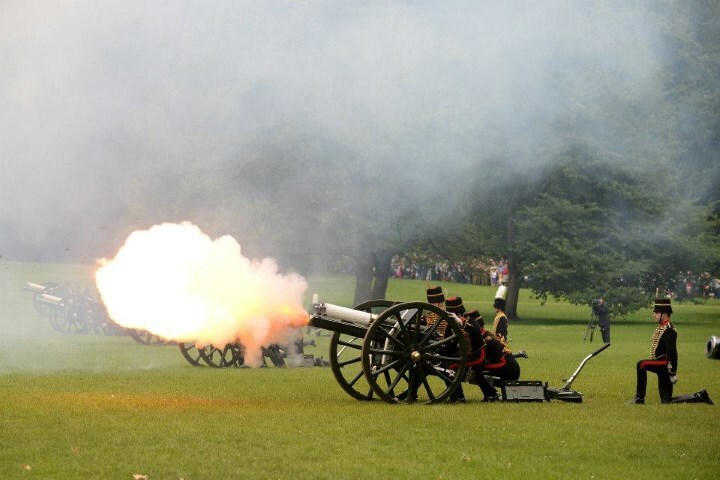 At precisely 12.52 pm, gun salutes were fired across the capital: the Honourable Artillery Company fired from the Tower of London and the Kings Troop Royal Horse Artillery fired from Green Park. 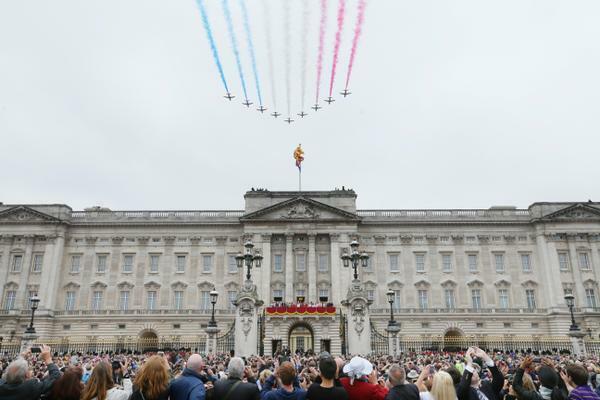 The Royal family assembled on the balcony of Buckingham Palace to watch the Royal Air Force perform a flypast. Does Prince George's outfit look familiar? He wore the same blue outfit with cream lace worn by Prince William for his first Trooping appearance in 1984. I thought it a lovely touch and very fitting for the nature of the day. Kate said to George "Do a wave, do a wave". A lovely shot of William and George. Other royals in attendance included the Duke of York , Princesses Beatrice and Eugenie, the Duke of Kent and the Duke and Duchess of Gloucester. The Earl and Countess of Wessex were noticeably absent, as they're representing the Queen at the wedding of Prince Carl Philip of Sweden to Miss Sofia Hellqvist. 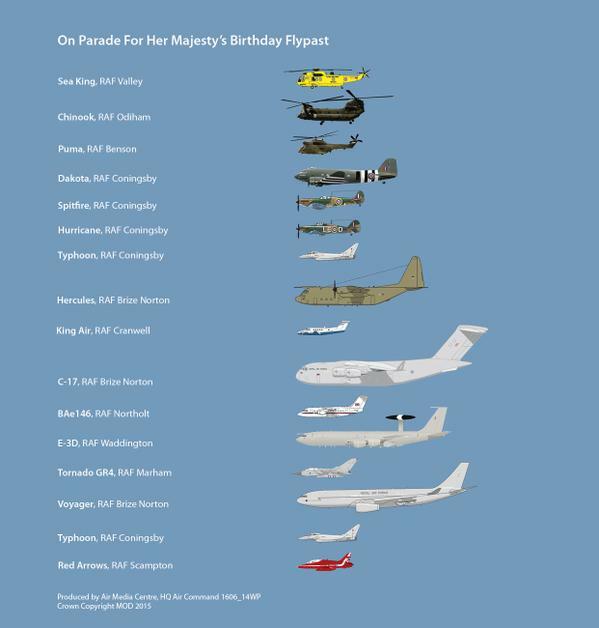 The Royal Air Force shared a graphic of the line-up for the flypast via their Twitter Feed. Prince George appeared to enjoy it. It is the fifth consecutive year Kate has attended the event. In 2011, the Duchess chose Sarah Burton for Alexander McQueen and in 2012 she opted for a bespoke Erdem piece. In 2013 and 2014, she chose looks by McQueen. This year the Duchess selected a new designer for the occasion, choosing the Catherine Walker 'Astrid' coatdress (with thanks to WWKD). 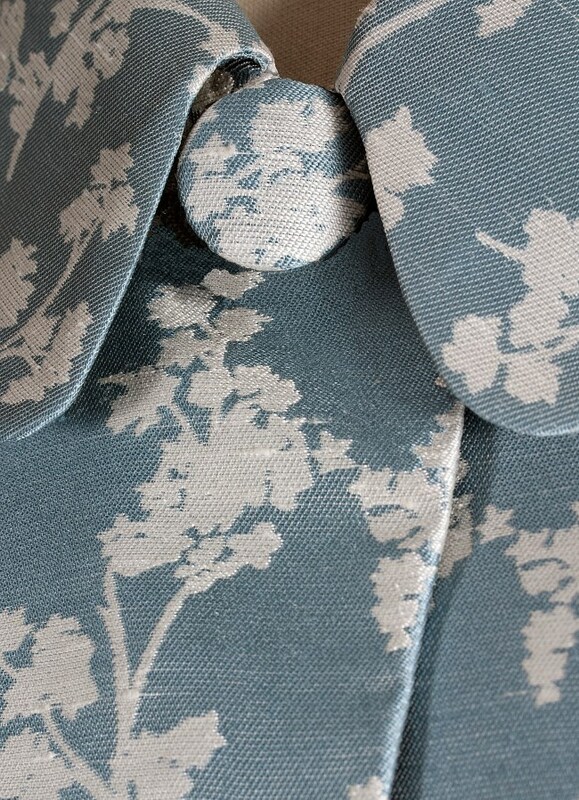 The garment features a contemporary pencil line, neat rounded collar, and is sharply tailored in a crisp textured woven ivory and ice blue silk. A look at the print. Do you like it? 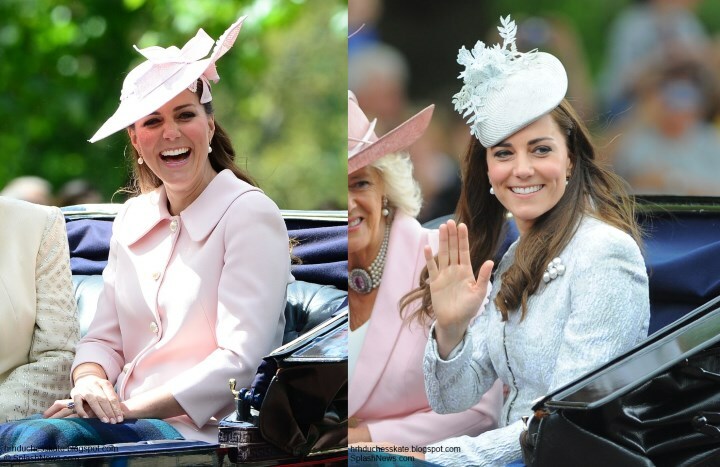 Anna from My Small Obsessions quickly identified Kate's hat as the Lock & Co Marisabel Hat. It retails for £895 and comes in several colourways. Below we see the piece in "coffee". 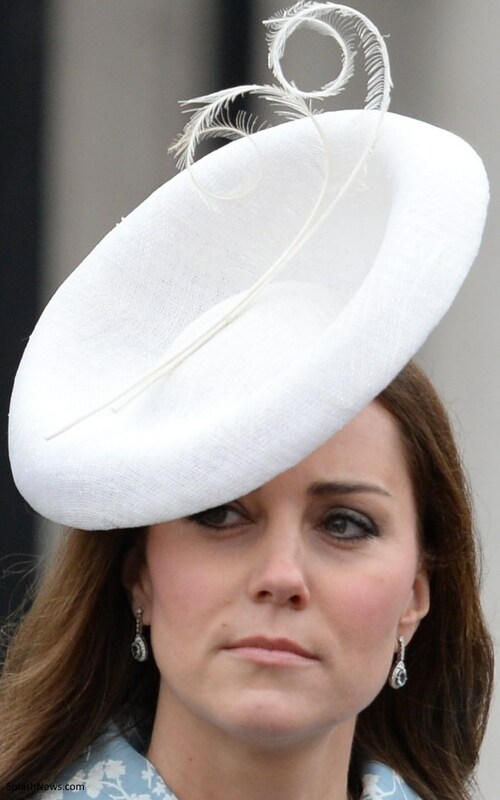 A closer look at Kate's hat. 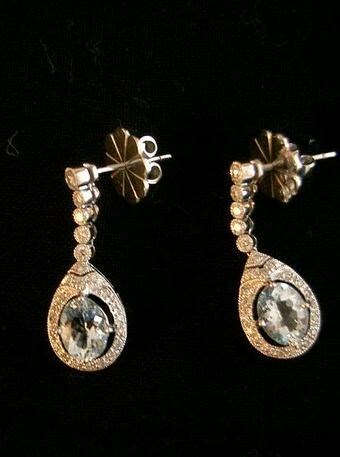 Kate accessorised with her unidentified aquamarine earrings (with another thank you to the amazing Anna). I love the cost. Unfortunately I don't care for the hat. I very rarely dislike anything Catherine wears. I think perhaps it is the size; I feel it should have been smaller or a larger full blown hat, this size is awkward. I also disliked the stark white, but that may only be because it emphasizes the odd size. Again, I love the cost, that blue and pattern are very lovely. I agree. I love the coat, blue, nice, summary. But the hat is off, maybe the size or the shape but off. My thoughts exactly. Also, how cute is Prince George?! I agree with you. The hat is ghastly, way too big, almost slipping into Camilla size. Other than the hat, Kate looked lovely. And Prince George is adorable. Loved the way they dressed him in the same outfit his father wore so many years ago. Agree! Love Kate in a nice print. For me it's not just the hat's size, rather, the way it's perched on the front of her head--it's trying to be a fascinator, but it's hat sized. George is a beautiful child. I'm glad we got to see the more candid shot of him with Nanny MT--I suspect that it shows more of his true boisterous personality than the balcony pics, when he looks a bit subdued, maybe because of the crowd and all that's going on. I, too, agree. The dress is great. The hat is too big, sits funny, and looks like it will fall off. I wonder how they all pose together without their hats bumping into each other!! Did I mention, I'm delighted to see the Royal Digest back. A wedding is a great place to start. And more cute photos of George over at the Daily Mail - first time, we've seen the little lad show toddler spirits. He is one adorable little boy. Maria looked like she was enjoying herself too. Kate looks really good, and I've always thought WIlliam looks great in a uniform. What cracks me up about Harry is how he's fluffing his hair to hide that he too is finally starting to get that tonsure baldness thing his dad has. To be honest, today William wins my Best in Uniform Award because he can really rock a bearskin hat. :) Plus he was on a horse and Harry had to ride in the carriage. I'm a bit torn on this. I dont like when Kate copies Diana, I think that is strange since she never knew her or she wasn't related. But I see why Will would dress George like him at that age. I think it it kind of sweet. So far we have only seen George during big 'firsts' such as his first Trooping and the hospital visit. I think those are bigger moments and it must be fun for Will to dress him similarly. As time goes on, I believe that will stop. I expect George to be dressed similar at the Christening since that is another first. I think it is sweet. I agree about William and fashion, blue27. He's got a look and he's sticking with it! That being said, Mr. bluhare is the same way. He would love it if men's clothes were like the children's brand that tells you what goes with what. He's clueless. Nice to see you haven't recloaked yet, World Traveler! To pony (pardon the pun) off Silvereyed's comment, does anyone know why Harry wasn't on horseback? haven't a clue Bluhare. Hasn't he always ridden in the carriage, at least since Kate and William got married. At least we get to see him on horseback from the polo matches. I'm presuming his regiment isn't being trooped but I'm no expert at all - would be happy if someone knows. Charlotte??! Any idea? Charles is Colonel of the Welsh Guards, William of the Irish Guards, and Princess Anne of the Blues and Royals, which is part of the Household Cavalry. Harry, who just left active military service, does not have such a title as yet, though William did while he was still flying in Wales. Harry is an officer of the Household Cavalry and not a Colonel yet. Since Prince Phillip and the Duke of Kent are, I assume that Harry will be made Colonel once one of them passes. The. Dress is not bad but the hat is awful!! I want to see Kate in old design hats like Princess Diana used to wear. Hhhmmm....it's not often that i really don't like one of Kate's looks....but for me this is a fail. My first thought when i saw the first picture was that the coat looked like a pair of pj's i used to own!! Lol!! I think, for me, there is too much white against the blue. & as much as I love Peter Pan collars usually i really think it is just too much with the patterned coat. The hat is lovely though & it's nice to see her in something a little wider than the usual pieces that she tends to favour. Of course, it is great to see her there today... I was really hoping she would be!! Maybe i'll change my mind on her outfit when we get to see it from the balcony. Awesome photo of Prince George! Doesn't he look excited!!! Can't wait to see his first balcony appearance! Oh my gosh, Nerissa, you took the words right out of my lips. I was thinking the print reminded me of PJ's or my grandma's old curtains :). I am just happy to finally see Kate, but I do agree that this coat was not her best choice. BUT I do love the earrings!!! OMG I want a pair! Divine!!!! Actually that material would make splendid curtains but being Catherine Walker - rather expensive ones. It makes me think of Gone with The Wind and the Sound of Music where curtains became successful dresses. The colours are the same more or less of the room Charlotte's photos were taken in - maybe Kate decided it wouldn't work in her home but would make a nice coat. hahaha!! Curious Kat I'm shuddering at the thought of that material as curtains.... but I guess it would look much better that way, for me, than as the Coat!! Julia from Leominster....I don't know if I'm going to be able to get the Sound of Music visual out of my head...hahaha!! Kate singing and dancing around the room as the curtains are pulled down ready to be made into a Coat. Made me laugh!!!! The hills are alive! Charlotte, you are simply amazing! You have the very best pictures and descriptions way before anyone else has even a brief article on line! Loved the picture of George and Nanny.Maria.I think that will be a picture that is reposted his whole life. It says so much about his personally and relationship with others. You are the best! Over here in Australia I've just watched the Trooping the Colour ceremony on BBC One, very moving. It was so cute to see George excitedly sticking his tongue out, standing with his nanny at the window. Seeing him on the balcony was really great too, he seemed very alert to everything and puzzled when the fly-past went overhead! I loved the way his cornflower blue clothing matched Kate's. I'm not sure what others think, but Kate appeared a little more serious than usual - no doubt with a 6 week old baby she isn't getting much sleep! What a great reappearance of Kate, and seeing George was the icing on the cake. I thought William looked very smart and handsome while riding with his beefeater (is that the word?) on his head. Charles just said the other day that unlike George, Charlotte is already sleeping through the night and making life much easier on her mother than George did. William said, the day he played polo, that Charlotte wasn't sleeping and that George is constantly in motion. Guess it depends on who hears what said! be heavy and a little cumbersome. Babies change so quickly, both could be right. I like this coat dress actually. At first I thought it was a cloud pattern and groaned a little bit but when I saw it was a floral , stopped the groaning. I think the dress has a pretty silhouette. Like the hat as well and glad to see something a little bigger on her. Im appreciating that it is not her usual style of hat. She looks wonderful and PG is fantastic! Thrilled he made an appearance. This look is somewhat of a miss for me, and I blame the hat. While I like it on its own, with the coat dress it's too much. The dress has a lot going on, with the bold pattern, buttons, and shiny material (at least it looks shinny) and adding this huge hat to the mix really doesn't do anyone any favors (even someone as beautiful as Kate.) While I don't hate the dress, I think she could have worn something a lot better, with more of a subdued pattern, like last years trooping, which I loved. So I'm not really loving this look. But I will add, she looks very happy and relaxed. And seeing Prince George, what a treat!! I was eagerly expecting little George to appear on the balcony since last year and here he is, a real showstealer! And what a nice touch to have him dress like his father 30 years before. I agree about the hat, but like that she's still experimenting and haven't settled into a uniform! How exciting to see Kate again! I feel like it's been forever! I'm in agreement with the others that I don't like the hat. It's too big and sits oddly on the front of her head blocking too much of her face. I'm still undecided on the coat. I don't like coats with very shiny patterns, and I think the print was too busy. I wish Kate would have worn a solid color coat, but I think she deliberately picked that pattern because it was distracting. Wow I really do not like this look. The hat stood out far too much and the coat did nothing for her and seemed a bit frumpy for her age. A total miss. Nice to see George out. Cheeky as ever. Did not like the nod to the past though. I think he is his own little man and deserved something of his own to wear. I am all for tradition but I wish they would create their own image, instead of copying the past constantly. Kate tends to nod the past a lot, which is really nice but find this a bit too repetitive. Anyway this littleboy seems to be full of spirit. I thought it was sweet. When I was small I wore things that my mother had worn and I've saved them for our children one day. It's not as though a not-quite-two-year-old is expressing himself through his own clothing choices. Plus, I think they tend to get positive media reaction by bringing out the nods to the past, and that's always a good thing for the BRF. I understand why they do it, it was a lovely gesture when Kate came out of the hospital in that blue dotty dress. Also it is enjoyable and fun to see once or twice but as they present George more and more, it would be nice to see different versions than the past. But thats only me!! I'm actually a very sentimental soul at heart and thought it was nice that George wore the same outfit this time. What really surprised me is how beautifully preserved it is and how good it looked. I guess when you're royal you've got a royal archivist who does this stuff. I'm sorry but I think the whole shorts thing looks ridiculous. It was a bit chilly outside and George was wearing shorts and short sleeves. He obviously had on pants and a cute sweater before being changed. Every time we see him he has on shorts. When it's obviously cool and William and Kate both have on long sleeves. I know it's some kinda royal tradition but it looks silly and he looks cold. Put him on some pants! I thought the outfit was a sweet touch but I did agree it was quite odd to see George in shorts/short sleeves when everyone else had long sleeves on. It looked a bit out of place until I realized it was William's outfit. 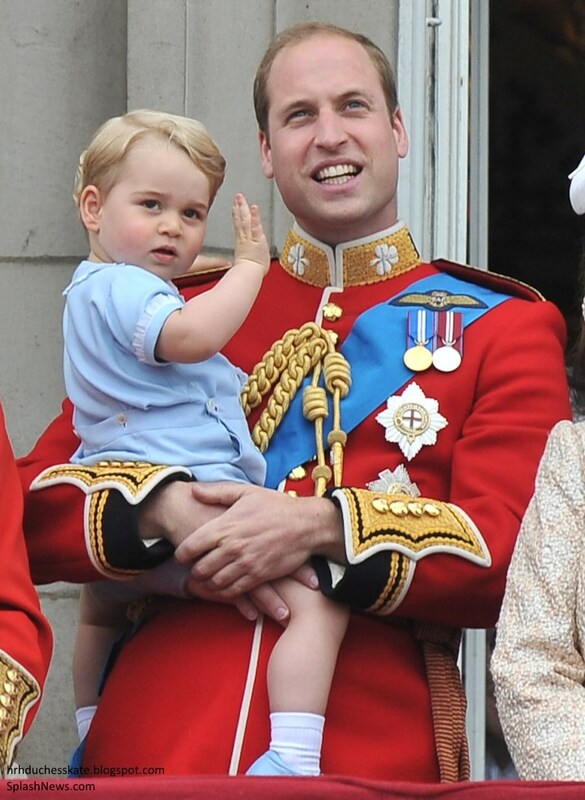 Oh, I can't agree with some of the above - I think it's spendid that George is in the same outfit as his daddy was. He's a hardy little one - surely he's not too chilled for such a brief time - and he doesn't seem so. He's much too young for long trousers to my thinking. Such a beautiful touch - linking George to something his granny Diana chose and to a time she was on the balcony. He has so much time to be his own man - It's lovely when something vintage from a previous generation can be used. Kate's hair looks lovely and natural. I adore her coat - most of her clothes are too young for me but that I would love to own - the weave on the fabric is gorgeous. In the US boys don't wear shorts and socks as they do in Britain when being dressed up. It's a cultural thing I think. It's also a traditional royal thing. Ok all of you who do not like the idea of them putting George in clothes that his daddy wore or that Kate wears things like Diana did. Have any of you ever stopped and thought maybe oh maybe it is William's way of keeping his memory of his beloved mother alive. There is nothing wrong with it. Perhaps they thought of all of that 17.25 and decided they still didn't like it today. Not everyone's taste is the same. Better to talk about WHY he wore it rather than nag on others for not liking it. A better way to phrase it would have been "I understand that some don't like this, but it is a nod to the past, and honors William's mother who probably chose that outfit for him. I think it was a wonderful thing to do and I'm glad to see a new tradition started". See how much nicer that reads? By phrasing your comment the way you did, you are making the point that it IS about opinions rendered here, contrary to what some say. You give Charlotte no respect at all by doing that. She is the one who controls what is posted. bluhare - my first thought on the repeated outfit from William's childhood was "whose job is that - to know to collect clothes after events, catalogue them, and be able to locate them 30 years later!" That's some grade A closet logistics right there! This is actually an outfit that Charles wore as a toddler, so it has indeed been superbly preserved. And with now a third generation of future kings wearing it, it is a royal tradition, not something Kate came up with to copy Diana. Moxie, I know. I want to apply for the job of Royal Jewel and Gem Archivist. I'd do an excellent job, and never, ever ever wear any while I was archiving. I didn't realize the outfit was originally Charles, Sofy. Did he wear it at Trooping of the Colour as well, do you know? How is George too young for long pants? I've never heard that before. He had on long pants before being changed. I just find the royal tradition of shorts a little odd. But surely there's not a 'proper' age when a little boy should wear long pants. P.S. I am waiting with abated breath to find out whether the blue outfit from today was third generation! Fantastic if it were! P.P.S. I am not pleased with the angst I recently feel emanating from this site. I have been posting for several years here, and I consider myself a centrist--sometimes in line with all things royal--sometimes not. I have always felt comfortable stating my opinion. Charlotte does a jam-up job--both with her superb articles and with her moderation of the comments. I hope we can refrain from one-upsmanship and insistence on getting the last word. Charlotte gives us plenty of room for diverse opinions without our "calling each other out"! Prince Charles was born in November, so he would not have been the same size in June, or in summer for that matter, as George and William, who were born in July and August respectively. Please, a source for Charles wearing the blue outfit?!? Charles didn’t wear it for Trooping, as far as I know he was older the first time he went. I have read on some forums that it’s the same outfit that Prince Charles wears in this picture with Princess Anne and some other portraits with the Queen. It’s a bit hard to tell, and of course all photos are black and white, but the ruffle on the sleeves and collar looks the same and the colour appears to be pastel. That would be so wonderful if Charles wore it too. I love vintage - wore my mum and nana's clothes when I was a bit slimmer and would love to see Kate in some of Diana's jewels at least. But some would disagree. I would not like to see Camilla wear anything Diana wore and never am happy when I see her with that POW brooch she's wearing today - I've heard it's a second one but have always been a little uneasy. Surely Charles could comisson a new one for her - so there would be no doubts. I know quite a few families in the US that dress their under age three little boys in shorts or romper outfits for photos and special occasions. At least in Seattle and DC the old fashion retro look is pretty popular. I see plenty of long pants also. Found this wonderful portrait of Prince Charles by Cecil Beaton from 1950. You can see the outfit clearly and it looks like a match to me. Because of how William is holding George you can’t really see the front and in pictures from 1984 the colours are wrong, so it looks completely blue. Thanks for digging those photos out! Really appreciated. I'm happy to drive on the left for some vault time, Lynn. You're on! The photo of Charles kissing Anne was from a set of her introductory photos to the public when she was born. She was born on 15 August 1950, and the photo was apparently taken when she was a month old, so in September 1950. This would make Charles 22 months when he wore the outfit. George is almost 23 months. William was almost 24 months. Thanks for all the information Sofy. You know your stuff! Julia, I believe it's the same brooch. And I am equally "happy" to see it these days. Hello everyone! I rarely comment here but always wait excitedly for a new post and read it as soon as I can and I love to browse through the comments! Charlotte you are amazing as usual and I am so looking forward to the wedding coverage over at the Royal Digest!!! I thought Kate looked lovely. I seem to be in the minority but I quite liked the hat more so than the dress even. Prince George looked darling! It was so funny to see him at the window sticking his tounge out, just being a silly toddler! I think maybe the dress would have looked nicer in white with a blue pattern, though I don't think the fit of it is that great either? as it is it reminds me a bit of pyjamas. And the hat is definitely too big. I think I prefer Princess Eugenie's outfit today to be completely honest! I liked both York princesses outfits too. How can you really tell the fit when you are only seeing her from the waist up. She is sitting then standing behind William. We pretty much only saw anyone from the waist up, right? So, if you prefer, I suppose we're declaring the best dressed torso. It's not often I think that the York girls are dressed better than Kate!!! But I 100% agree with you today! I really loved Princess Eugenie's whole outfit and Princess Beatrice's hat. The Troping view can make a difference - I quite liked that cream coat Kate wore the first year but when she wore it to the garter ceremony the next year thought it was too girlish and short. Sometimes even a different hat can make a difference - a picture hat would be lovely with this coat. Totally agree. Very rarely does Kate miss a step with her look, but the hat looks out of place. I have to chime in and say I hate that hat. The dress is fine, but the hat is definitely out of place. The Duchess of Cornwall's outfit is beautiful, but her hat is awful as well. I love seeing PG in William's baby clothes, too cute. The photo with his nanny will be a classic. Hate the hat. Awkward size, too bright white, my least favorite hat she's ever worn. The dress is more suitable to a 70 year-old. Pretty color in contrast to the dreary shades worn by the Princesses York. What s lovely touch in George's outfit. He's the highlight of the day, of course. George was the best part of the day for sure! I'm afraid I didn't like this outfit on the Duchess one little bit. The hat is oversized and doesn't suit her at all, looks like a flying saucer. The pattern on the dress reminds me of a curtain and the Peter Pan collar is stiff and boring. And she looked washed out with no make-up and pale lips. Not at all the beautiful, glowing princess we are used to. Pity. But baby George is gorgeous, of course ! I'm assuming the dark-haired boy next to the queen is Viscount Severn? It always amuses me to see children in suits. I'm headed off to watch a stream of the Swedish Royal Wedding! They're currently running home video (although their home video is quite professional grade) of Prince CP and it's a treat. Great to see the family! The stark-whiteness of the hat made it photograph poorly. I think it looks fine in the coffee color, but terrible in white on Kate's head. Not a fan of the pattern on the coat, but I agree that she might have picked a distracting pattern deliberately. She looks great, but she might not feel back to normal yet. George is cute and I understand the nod to the past, but I thought his outfit at the window with Nanny Maria was much cuter and more in keeping with a traditional, yet modern child. I like the Duchess's look, obviously chosen to go with the pretty Prince William outfit that Prince George wore. He looks so cute, with his little white socks and blue shoes. Since he and his father were born in adjoining months, the romper fits him, apparently perfectly. I'm wondering where this outfit has been preserved. Diana no doubt kept important things from her sons' early years, and someone has maintained them. I've never understood flying saucer hats or fascinations, but this one looks nice seen from the open side. From the top, it's a bit large. 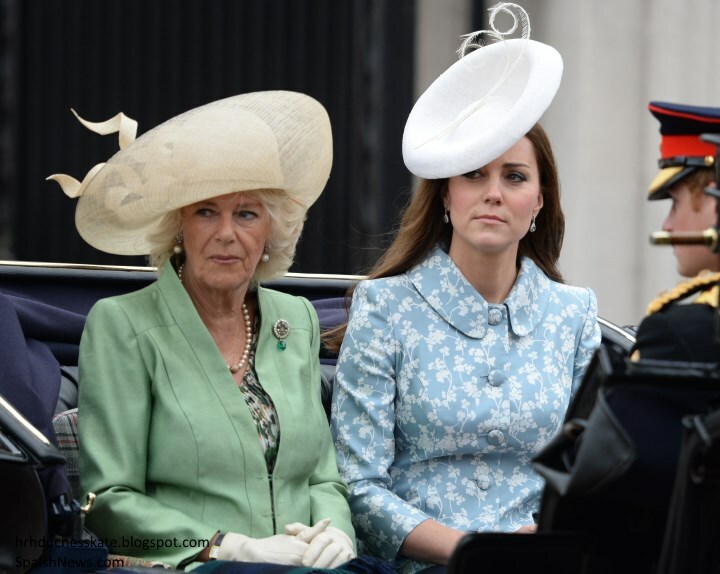 Kate may have wanted a degree of sun protection, and sitting next to Camilla she couldn't wear a tiny hat! All in all, she portrays England in June. 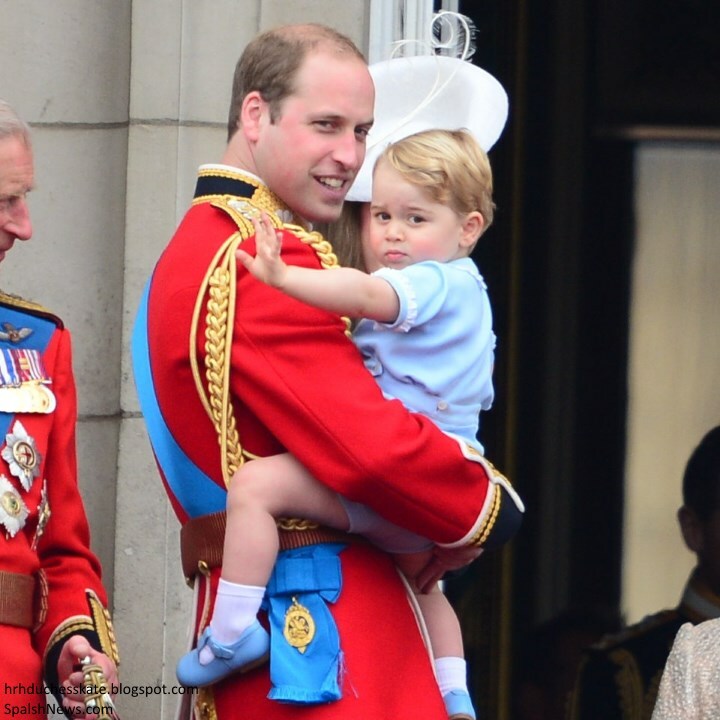 Those little shoes are almost Garter ribbon blue, and that's where they are when Dad holds George, right beside the ribbon. I suspect Kate planned that, since William wore black or navy shoes with the outfit. Does anyone have a link to a photo that shows Diana that year? Did she also dress to coordinate with William's outfit, as she did in green the year of Harry's tongue? Sometimes her outfits were actually the same fabrics as the boys'. OMG! Do you remember the little blue coats? I saw those at the Althorp Diana exhibit! Precious! anon 20:54- Oh, my goodness! The Year of Harry's Tongue! Now we have The Year of George's Tongue. Whose tongue will next year belong to? I always think it's nice when they coordinate - the wrong outfit colour can really stick out in photographs - Kate's art background no doubt helps here - I think she has a very good colour eye. The photos of George and Charlotte showed that. Fascinators, that is. I suspect my goofy iPad changed the spelling! I think that it was decided purposely that William would hold George, flanked by the Queen and Prince Charles; symbolically showing four generations of Monarchy. Prince Charles is all for scaling things down. Remember the balcony appearance at the Jubilee? Just the Queen, Charles and Camilla, William and Kate, and Harry. On the BBC video, one can see Andrew and Harry trying to get William and George into a visible spot. That did not look planned, but it worked eventually. I'm thinking my original comment was lost. To say again, I love the coat. The colour is perfect on Kate and the material is very rich. It must feel wondereful to the touch. The hat is unusual = I don't mind it so much but the outfit could use a better one. George is so precious and was so animated inside - the first time we've really seen that it's lovely and lovely to see him on the balcony with his dad - and looking so much like him back then. His clothes are adorable. The queen looked a little subdued in more of the pictures than usual - I hope she isn't poorly. I always love seeing the whole family gathering. I appreciate your comparison of Princes George and Harry. I think Prince George looks to be simply excited while it appeared to me the Prince Harry was being a little naughty. The look on Diana's face is probably what leads me to think he was being naughty. I love the fact that Prince George was wearing an outfit of Prince William's. I also love the sentiment of Julia from Leominster that this linked George to a time when Diana was on the balcony. 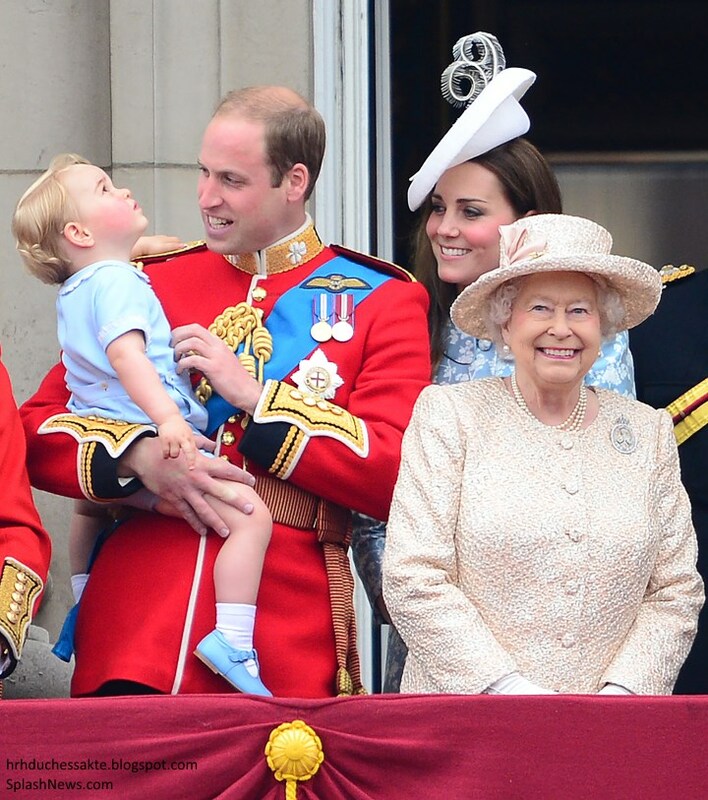 In addition, I enjoy the fact that Prince William was holding George just as his father, Prince Charles, held him. A nice link between father and son. I don't care for the shiny fabric of Kate's coat; otherwise I like it. She doesn't seem to me to look as if she is feeling well. With the exception of 1 or 2 photos, her smile looks very forced and her eyes look very tired. I hope that all is well with her. Prince George's hair is in lovely waves instead of flattened down! Applause!! Oh yes!! His hair is beautiful. I like seeing the natural curl, too. I could see curls in back as well as those in front, a lovely gift from his mother! I am also fascinated with his very pronounced (and very cute!!) cowlick--right in front, aligned with his part (almost!). I have been examining everyone's foreheads, trying to figure out who bequeathed that cute little feature. I remain puzzled. Has anyone here figured it out yet? And I think he got Diana's beautiful complexion!!! I don't think that I am as enamored of Diana as many of you appear to be; however, no one can dispute that she had the most beautiful complexion ever--a genuine English rose! While I can't call George an English rose, I guess I will just say scion of an English rose! You took the words right out of my mouth! I was just about to post the exact same thing anon 1646!! It's funny isn't it as a there was a bit of talk on one of the last posts about how people wished that Kate and Will would leave Prince George's hair more natural....and today here we have it!! LOVE the curls, particularly at the front. What a cutie pie!!! In a sentence I thought I might never type: Eugenie wins best dressed for me! I just looked at Eugenie's outfit. You are right. She does when best dressed (very rare indeed). She looks very chic! Okay, I take that back, I think Bea is the best dressed! Lol, I love her coat (not the hat/headband thing). Yeah, I really liked Eugenie's hat, that's what put her over the top for me. Bea's coat is nice, though. I thought the same thing - what is it coming too that Kate lost in that crowd?? Bea looked ill. Eugenie looked healthy and happy. I disagree with most of the above posters. The Katherine Walker coat is fresh & modern - patterns are everywhere this year & the cut and colour beautiful on Catherine. As for the hat, have to say I love it too. 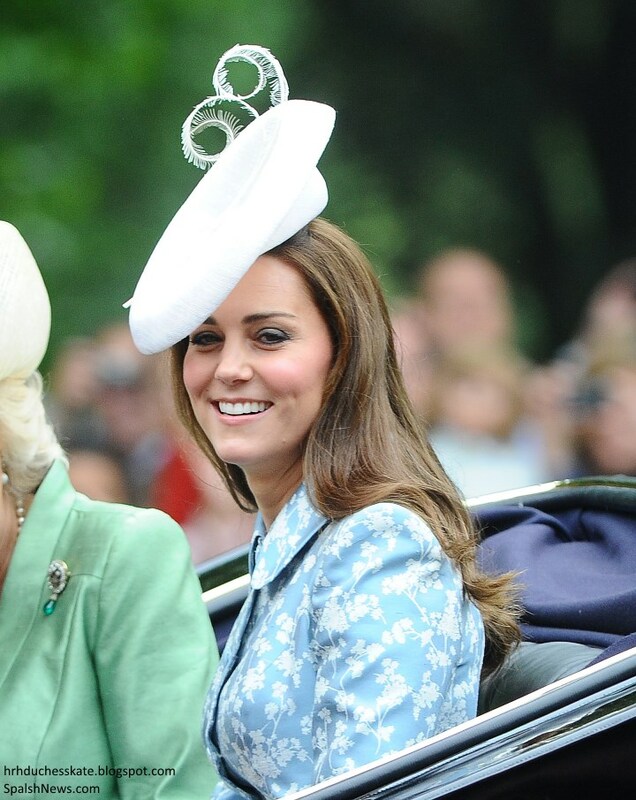 It must be so much fun to be able to wear some of the hats & fascinators the royals adorn. They are pieces of art. Have to also say how well Catherine looks and is obviously already in great shape again. I agree with you, Jeanne, Vancouver. The only "problem" with the hat is that it reflects too much light. Therefore it looks like a white blob in most shots. All the detailing (which shows on the darker one the model wears) is lost. In person I'll bet it's a smashing combination. 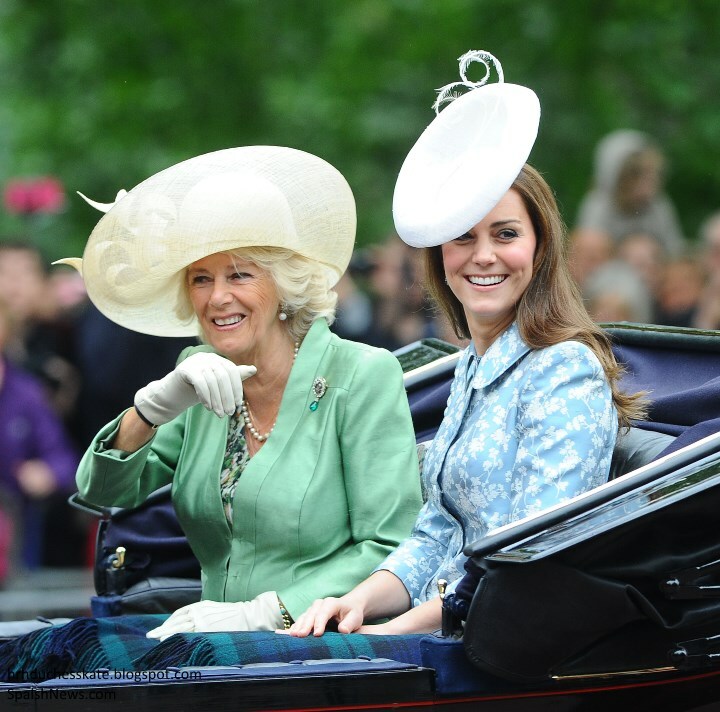 Being a brat, some future year I'd love to see Catherine go for a hat bigger than Camilla's. It would be great fun (along with all that magnificent horseflesh and testosterone) to enjoy a millenary duel. If I were Catherine, this one time of the year I'd occasionally take the MIL on! Philly, you are too funny! I enjoyed your comment so much that I had to post. Thanks for the explanation on why the hat looks blob-like. Wish I could've been there in person. I forget how much photos can differ from real-life. So, just from the pictures, I like the dress (wasn't sure at first - but the pencil skirt description sounds nice), but not the hat particularly. And she does look tired, but I probably looked much worse than that when my 2 daughters were both under 2! I love the nod to 21 years ago on the balcony with Diana and William, and how Kate's dress matches George's outfit. All in all, it's just great to see them out at an official celebration with all the pomp and circumstance! Now that would be fun - I can imagine a war of hat sizes - the ladies would have a hard time fitting in the carriage. Kate would surely lose - no one could possibly out-hat Camilla except for maybe Princess Michael. At the risk of being seen as too critical, I loathed Camilla' look-at-me hat today and while I loked the soft green on her, the style of her coat is so aging. To me she looks almost as old as the queen. Definitely NOT fresh and modern. But she looked lovely despite it. A wonderful series of photos and post. Thank you so much for sharing. I think Kate looks wonderful. Imagine having given birth just 6 weeks ago. Her choices are always classic. She was nicely color coordinated with William and George. I don't think she was hiding behind the Queen. Kate s extremely popular yet tries not to steal the show. George was so cute in the window and do well behaved on the balcony. I am impressed with Kate & Williams's parenting skills. Thought Camilla and the Queen looked great too. Loved Camilla's green coat and beautiful broach. 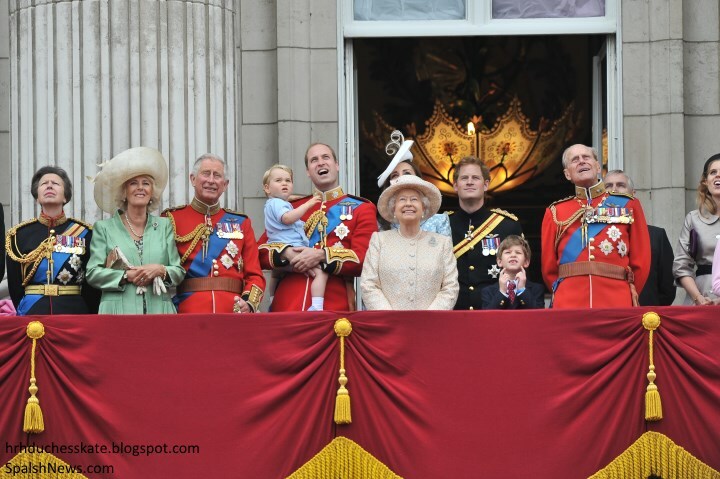 Thank goodness for Charles & family otherwise would be a pretty dull and unstylish balcony. I agree about the parenting skills. I noted how when George started to seem a little befuzzled by the lypast William tickled him a little. That takes a parent to do and to see, to distract before something happens rather than comfort because he started crying. So cudos. William did really well keeping George safe and involved. I have chills. Could prince George be any more perfect? Everytime I see his little face he makes my whole day happier. I love that the family, especially his grandpa Charles, seems to enjoy him so much. His tongue in the window was so perfect and I love that it was likened to Prince Harry, perfect, perfect, perfect! I love Nanny Teresa looks as if she gets a kick out of George. It's important that a caretaker loves a child almost as much as it's parents do. I think Kate looks young and happy again. She looked tired last year at this event and I felt like she looked tired much of last year, even before her pregnancy. She has her fun-loving-personality-look back and it's what I love about her most! 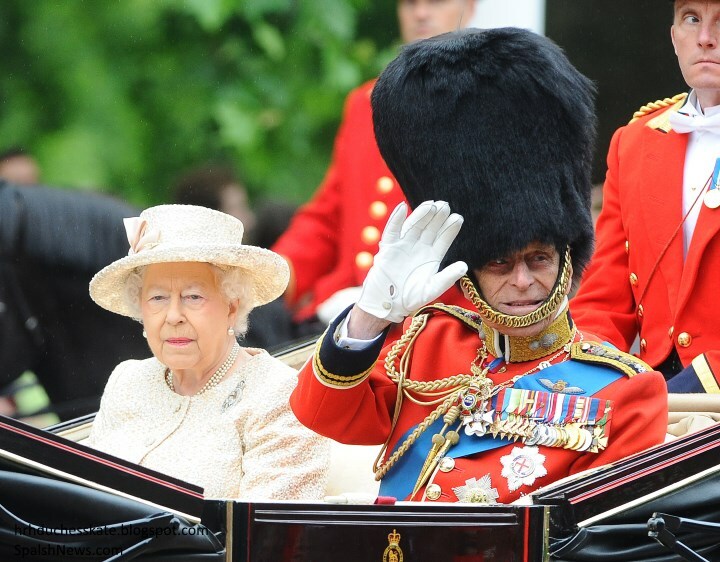 God bless Prince Phillip, he still gets out there and holds that giant hat up and all his metals: what a trooper! Lastly, I LOVED that the Twitter feed showed the C-17 plane being flown, my husband flies that plane for the U.S military, so I got a tickle that I had a connection in a weird sort of way. As you can see I had a lot to say today ;) Wonderful post Charlotte, as usual! Thank You! Lovely remarks about the plane and Kate, Tammy, How splendid it's the one your husband flies. haha! lol! What a great visual! The balcony is not dull if you can see the whole thing! The Queen gathers as much of her extended familly as possible for Trooping the Color and the Christmas luncheon, which are six months apart, so she has them all with her twice a year. The BBC video shows a glimpse of everyone, including James and Louise near the Queen. There is a multitude of Kents and Gloucesters at the ends of the balcony. If we could see a closer shot, we'd see many elegant outfits. I assume the family gathers for luncheon inside afterward, and maybe Teresa has Charlotte ready to be admired in there! I loved George's outfit and his cute blue shoes to match his outfit. Kate's coatdress was OK and really didn't mind the hat. I did think Kate looked a little tired, but have to understand she is just 6 weeks past the birth and still getting back and I was just happy to see her and George. The most notable thing after George and Kate's appearance was how James and Louise were on the balcony while their parents were representing the Queen at the Sweedish wedding. I just loved how the Queen appeared to look after James and kept him close to her just like a Gran. IMHO, Kate's best balcony look overall was in 2014, just a year ago, when she appeared in the silvery McQueen suit and that amazing brooch. She looked - they all looked - elegant, yet also relaxed and happy and joyful, smiling and how can we forget the great photo of Kate laughing at some remark made by Harry? This year, things look - more somber and definitely more forced. The friction between Camilla and Kate is so, so obvious. That's nothing new but apparently they're both making no moves to mask it in public anymore (harkens back to that 1992 photo of Diana at the gala dinner, just days before the separation was announced). There have been repeated and ongoing reports that the queen experiencing signs of Alzheimer's Disease and while we can't believe all the trash tabloid reports, when the same story appears in different versions across the media, there has to be some grain of truth to it. I have noticed that in her recent appearances, at Epsom and others, the media are now being kept quite a distance away from the queen, not within hearing distance, as they used to be. So it does tend to make one wonder what the deal is. There is the ongoing friction between Charles and his brothers as he prepares to assume the throne and the big question of if/when William and Kate will ever assume royal duties vs. the amount of duties being carried out now by the royals whom Charles appears to be alienating or dismissing from the "senior royal" ranks - and who were on the balcony today. So I'd expect that this isn't exactly the happy-happy, joy-joy huggy family moment that the spinmeisters at KP and Buck House are trying to portray. Kate's coatdress? Mmmm, not one of her worst looks but not one of her best either. The hat is awful, too big and it just overpowers her face and head. The coatdress is just okay. I am so not a fan of that buttoned-up-to-the-chin look on young women like Kate. It's dowdy and dull. The silver McQueen suit did have a high collar but was a bit open in the front. The Christopher Kane coatdress that she wore last year at the Garter ceremony would have been a great choice for the event today. The photos of Maria and George at the window are the best and thank you so much for the clarification. The media and other blogs have it that George was "making faces at the crowd," ie carrying on the spoiled brat tradition of his father and uncle and really kind of a slap in the face to his future subjects. It's nice to know that he was reacting as he saw his parents. And what a lovely smile Maria has, it would be great to see it more often when we see her in public!! Charlotte, here's a question - I was recently going back through some of the great outfits she wore during their first royal tour to the US and Canada and then the Asian tour. What becomes of these clothes? We've never or rarely seen Pippa in any hand-me-downs. And I would think someone would notice any of the dresses if they were donated to a resale shop, even a high-end shop. That's a lot of money on clothing that was only ever worn once - and yes, I know Diana did exactly that but it was different economic times and mood 30 years ago!! We can presume she keeps or donates her old informal clothing, but what about the spotlight pieces that she wears in public? Kate is a great recycler - it's one of the things that I have always, always, always admired about her and hopes she keeps up as she and William move closer to the throne, but I'm just curious about what happens to the ensembles that have been worn once and never seen again? She was the thinnest she's ever been right after the wedding so I can't imagine that, even when she's at her pre-baby weight, she would ever wear those dresses again, regardless of weight, her body itself having changed after two babies. Camilla and Kate chatted quite amiably in the carriage, if you look at the BBC video. And I have seen no rumors about the Queen's health. Could you post links to sources of rumors? Kate was very slim during the Canada tour after the wedding, so those outfits might not fit. But I have also wondered about her southeast Asian tour wardrobe. I believe two of those dresses reappeared in Australia, but I would love to see the beautiful dress from the orchid park, and the two pale blue dresses again! I saw no evidence of any friction between Kate and Camilla. In fact there were many pictures and video of them talking, smiling and interacting both in the carriage and on the balcony. I also have not seen any thing published about the queen and Alzheimer disease so please if you are going to say this please, please give us a site reference. How can a 23 month old be termed a "brat" and be seen as "really kind of a slap in the face to his future subjects"? A slap in the face? Really? He's not even 2 so I'm pretty sure most people would be lenient if the future monarch was "making faces" to his subjects. "carrying on the spoiled brat tradition of his father and uncle" - hes a small child have some mercy. Love the dress and hat on Kate, and love that they dressed George in something his father wore at the same age and for the same occasion. Once again, I cannot get over the number of negative commenters here! I would love to see what even half of these people are wearing as they tap out their little mean comments and judgments from the comfort of their homes and anonymity! Agree with you 100%, Jill. The way I look at it is mean and judgmental comments usually come from angry, unhappy people who have little to do in their empty lives except to make nasty anonymous comments about people they don't even know. Jill, Thank you for posting what I have been thinking! I agree 100%!! Jill- why do you think people are mean here, simply they are stating their opinion whether they liked what Kate wore today, the majority didn't so what? blue27, if you think the comment you are mocking @20.47 was mine, you are WAY OFF here. Please contact Charlotte to check into the IP address. It may be shocking, I realize, but there are other people here who share my point of view. And please stop the mimic-like attacks. It is boring and very junior high. Jill, I don't mean to be rude or to hurt your feelings but I am confused about your reference to negative comments...Are you referring to our opinions on what Kate wore today??? I ask only because this is a fashion and lifestyle blog where we all come to discuss what Kate wore....I think that comments, both "positive" and "negative" would therefore be acceptable as not everyone loves the same thing. I don't think that what we are wearing ourselves - or how we look in person - is in any way relevant to our opinions on Kate's outfits. I for one have been reading this blog for a very long time (never really commented before) and I find the differences of opinion - on Kate's clothes - to be fascinating! Apologies if you were referring to something else that I may have missed. Well, I don't mind telling you what I'm wearing - it's a dressing gown I got at Harrod's a thousand years ago and if you don't mind me saying so, I think it's held up rather well. The spaniels are snoring, hubby's still up puttering somewhere and I don't think my life is empty at all. We have our worries - who doesn't, and there are some contributers here who have big worries indeed - but I'm certainly not unhappy. Now has it happens, I liked -- even coveted - Kate's dress and think the design is quite practical because she is probably nursing and had Charlotte inside. However, over on Sartorial Spendour I just typed in a comment rubishing the pattern Crown Princess Victoria's gown she wore to her brother's wedding. Does this make me a terrible bitter person or does it only apply to critics of Kate? Maybe it's just I saw tyre tracks where others saw ferns and thought the design edgy. These are fashion blogs and there will always be disagreement. When there is a pattern and an unsual hat - there are bound to be those who differ in opinions. And it may vary - yesterday Queen Maxima was assaulted verbally by almost all for wearing culottes - today she looked fabulous - at least to me. So let's agree we can like or dislike a look. Otherwise, we really will end up like back in grammer school, where the popular girls decded what everyone should think and heaven help anyone who disagreed.with their view. There is a blog out there like that where people pat each other on the back for saying the "right" thing and frankly, maybe because I was never an "it" girl, it makes me uncomfortable. I'd rather skim over comments I don't agree with and move on - and wish all others would too - even if it's about the queen's mental state - and no, I don't think she has Alzheimer's - at the WI the other day, she seemd sharp enough, but she did look a bit weary today. I wish she would cut back - but doubt she will. As for anonymous - no one of sense (as hubby reminds me) would put their full name in - the advantage to some name is it does allow us to identify and track remarks - why I use one and appreciate it when others do - as it can be hard to tell who is who when anonymous is used. I don't think Kate quite has her figure back-why on earth should she. Perhaps she will have the dress altered when she does or she might hand it over to Carole - it would look splendid on her. I also agree with you Jill. It's one thing to not like an outfit, but it's another thing to totally state as fact when there is absolutely no evidence that a problem exists. I am perfectly happy and not angry... I just don't like the dress. I think the pattern, fabric and cut were more appropriate for someone in there 60s'. My opinion is valid. Despite having that opinion, I think Kate looked beautiful b/c she'd look beautiful in a coat. Jill and anons and others should settle down when someone has an opinion that thinks Kate could do better. Where did I make any reference of you in my comment, exactly?? Please, enlighten me. At least I am not lazy to pick a name and also it is not me who jumps into conversations and say something unfavourable and leave. We all have such different perspectives because I think this dress woulf age an older woman while a younger one can get away with it. Kind of in the same vein as younger women look fabulous in vintage but the older woman would just look old. I think Jill had a valid point- it's one thing to debate the Duchess' fashion choices but a lot of the comments go straight to the jugular every time. I never comment because I get to riled up to say anything that doesn't sound snarky back to those being so critical and then I just feel like I've stooped to their level. Everyone has an opinion about everything but there is always a more positive way to phrase your critique. Charlotte does such an amazing job with this blog and it's the only one I read. I just think commenters border on disrespectful. We all come here because we are fans of the Duchess of Cambridge and it is always a surprise at the sharpness of the words chosen. Argh, I am so sick of these coat dresses that she wears buttoned up to her neck - she's 34, not 64. She is too young and pretty to dress so boring. Between the York sisters and Sophie Wessex, I feel Kate is lagging behind...I just wish she would step it up a notch and wear something different and fresh. I totally agree with you. I loved what the York sisters wore and wished she had put something like that on. Completely agree. And the pattern and fabric was very aging - not even the coat dress but the fact that it looked like a curtain. 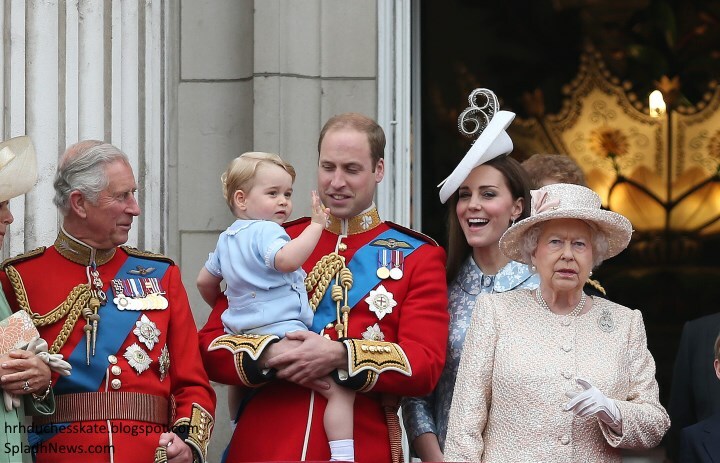 Charlotte - I just wanted to point out that you've got a rare photo up on this page from the Kensington Palace Twitter Feed - there are four generations all standing together - Elizabeth, Charles, William and George. It's only the 2nd one we've seen since George's Christening. Now THAT is a NICE point Moxie. So HAPPY that you and Kate got to get together. How amazing is that? And that you got to see WK&G. Amazing! You have to tell us everything!! I liked the coat dress today on Kate- the color and pattern were beautiful and becoming on her. Like the others who have commented, I did not think the hat went with well with the dress. It was too large and sit funny on her head- it reminded me of a flying saucer!! It was great to see Prince George in the audience being held by the nanny! His expression was priceless and reminiscent of Prince Harry (like you shared Charlotte). I thought Kate looked tired but good. Great to see them all on a wonderful occasion. I forgot to add, that I have come to realize, that I am not a fan of Catherine Walker designs. I don't think she has a youthful enough look to her outfits that look better on Kate. I think McQueen by far is her best designer and understands what she likes, but still make her look her age. Kate looks elegant in McQueen. Agree. I don't care for Catherine Walker. I loved, loved, loved Catherine Walker's designs on Diana, from suits to dresses to gowns. Her designs and Diana's stature, height and figure were a perfect pairing. That said, with the exception of the short-sleeve grey Catherine Walker dress Kate wore during the Canada tour, the Walker designs have never seemed to suit Kate. They look old and frumpy and just unflattering, in ways that Walker dresses never, ever looked on Diana. Maybe the designers (Catherine Walker died in 2010) is designing now for an older, upper-class woman - that Kate won't be for a decade or two. I also wondered about the temperature because everyone seems very bundled up and someone else mentioned about the short set on little George, that it was pretty cold to have an outfit like that on him. But Walker's work is always meticulous. So many of Kate's McQueen garments are not well made, and some are oddly designed. It seems to me that her McQueen things are either wonderful or woefully off the mark. So, really, she cannot depend on McQueen. This coat dress, whether or not one likes the fabric, is beautifully tailored. Cheers to all & Happy Belated BDay To The Queen! Can someone explain why a group of Royals stayed behind on the balcony after the Queen had left? I don't remember seeing that in years prior. Have they done it before and I just didn't see it? I am referring to the picture of Kate, Camilla, Eugenie and Bea on the balcony after everyone else had left. That is actually my favorite photo because you can see Kate more, so I am really glad they did that with less members of the family. I just am trying to see if there is a reason, like new protocol, they did it that anyone knows about? I really hope they start doing that every year, especially since Kate was hidden in the larger group and we could see her much better in the smaller group. This was before everyone got back to KP. Kate exited with William and George.. They did not stay behind. That is a picture from earlier while the queen and William and Charles are down below reciveing salute. They then go in and come out againn the whole group to watch the flypast. The Queen is the first to leave and they file back in after. They all can't get in the door at the same time. I didn't think they stayed any longer than it took for every one to get inside - so no new protocol. They were on the balcony before, not after. It was lovely to see HRH again, she looks amazing but a bit tired. Back and forth between homes with two small children, even with a nanny, must be exhausting. I know she isn't carrying her own suitcase but still, all that back & forth. I am not a fan of the coatdress look, especially buttoned up to the chin. Per previous posts, HRH is a young woman and I feel this look ages her, but if this is a comfortable way to dress for her, so be it. I like the smaller hats too. That smile of hers when she was looking at her son......well it truly could light up a room IMHO. Happy week-end everyone, thank you Charlotte for your amazing coverage. I thought they were there before the Queen and others came out but I could be wrong. 1) Does anyone know the identity of the others in the window? Was the young woman perhaps Maria's sister with maybe Maria's niece? Was the very pretty, beautifully dressed older woman perhaps Maria's mother? (I have an enquiring mind and a vivid imagination!) The pictures were delightful! 2) Charlotte, do you accord any particular significance to the fact that Camilla (who looked very good today!) was positioned in such a prominent spot while Kate was totally hidden? Of course, nobody paid attention to anybody but George and William anyway, but I'm curious about what others think. 3) I was very happy to see Kate. I was not a fan of the outfit, neither the coat nor the hat. However, since I'm sitting here in khaki Bermudas and a t-shirt, I don't speak from a lofty fashion platform. I did so much prefer the ice blue suit last year, and that white coat with the peplums just four years ago was dynamite!!! It was elegant--with lots of pop! I hope she'll recover some of her old pizzazz in the coming months. She's only 33 years old!! 4) George was beyond wonderful!!! I absolutely loved the beautiful blue outfit that he "repeated" after 31 years!!! Besides the sentimental and historical significance, it was just a beautiful formal outfit for a baby boy! (And YES! he is still a baby--not even 23 months old yet!) And in this sphere, I do speak from a lofty platform, since I have for almost half a century created smocked, embroidered, hand-sewn children's clothes in silks and batistes--for boy babies and girl babies. Though I enjoy seeing little boys and girls in jeans and boots and leggings, etc. at play and on casual outings, I will never relinquish the esthetic joy of seeing little children all dressed up in beautiful clothes for special occasions. 5) William looked pretty good in his formal attire, too!!! I agree. Kate's smile could light up a room. I feel she is a very strong person who has a lot of joy. It showed in the photo of her as a very little girl climbing whatever it was. And in the photo of her with her father and Pippa when she was younger and in the Middle East. No wonder William calls his rock. earrings, their engagement pose being the same as his parents. They all bring into current thoughts and conversations the name of Diana. She chose that outfit. and alive in the minds of the media whether the media is comfortable with that or not. He is "keeping her a part of it all". I thought Kate looked lovely today! Perhaps in some pictures she looked a little tired, but who wouldn't six weeks after giving birth . So fun to see George! I can't wait until you identify the new earrings! that. Not trying to make a big deal. Silly discussion on other blog about Kate's place, silly. Kate's clothes, granny's curtains and a toiletseat but I couldn't care less. Somehow she manages to look good in that as well. William on white horse, perfect. Another comment. Here's my frivilous list of favourite trooping clothes for Kate. ....actually the outfit she wore in 2011 is probably one of my all time favorite Kate outfits!!! I still just DROOL over that coat!! Don't care for Kate's coat dress at all - the fabric looks like a couch I had in the 90s. The cut is not flattering on her and the hat was just OK - but on the hat, at least was nice to see her wear something a tad larger than so many of her hats that have been really small or horrible perchers/facinators. She had a larger head and can and should be wearing larger hats. The coat dress I just hope we don't see her repeat it again - it's one of my least favs she has worn. She also looks like she is not recovered her figure this time as fast in post pregnancy which is more what I would expect vs how fast she turned into her old figure after George was born. Nice to see the family there together - I saw other photos with the extended family and it must have been a fun celebration for HM. As to all the negative comments about the coat dress: I think we, Americans especially, fail to consider London weather and the chill those riding in open carriages might experience without this wardrobe essential. I would think Kate especially would try not to become ill and possibly pass it on to her children. I thought she looked radiant today in light of the fact that with a new baby in the house she is probably a bit sleep deprived. - it was pretty cold! I wished I had a coatdress too..
Agree with other commenters that the photos of George are priceless. There are a couple of the Duchess smiling at George on the balcony that are also classics. While this outfit may not rock it's appropriate to the event and as Rebecca has pointed out in her sparkly way Kate still manages to look lovely. IMO these days when photographers can take up to 60 images per second you can't assess mood by looking at still photos. There's too much scope for manipulation through choice of particular images. I watched the BBC video and there were plenty of smiles, waves and relaxed moments. A lot of the times that Kate's looking serious so are Camilla & Harry in the carriage & the others on the balcony. The pageantry was awesome and I hope we get a first hand account from Kate (Texas) & Sarah (California). Kudos to Kate for appearing as it's only 6 weeks since she gave birth. I remember this stage as being really intense not just because of the baby but also because the hormonal download was still going strong. Getting out the door not looking an absolute mess was a challenge let alone putting together an outfit that can withstand the sort of relentless public scrutiny she gets! I don't think her outfit was terrible, but she's done better in the past. The coatdress's motif looks kind of old-fashioned and something that Queen Elizabeth would wear. The hat is too white to allow us to enjoy any detail on it. I'm guessing Kate didn't invest too much time in her outfit because she has a newborn to look after and her energy is probably mostly spent on her babies, and not her wardrobe. Her earrings look like ones we've seen her wear before, except those might have been blue topaz, and these look like aquamarines. Or maybe it's just a trick of the light. I would love to get an ID on these soon. On the way, there is a photo of the balcony when William first appeared. Diana was way on the other side, dressed all in blue like William, and pregnant with Harry. I wondered whether her being so far away was deliberate on someone's part. Has anyone seen a video that would show who walked out first? If she did, she may have thought Charles was right behind her. If he did, she must have chosen a more visible spot where she could see William from afar. Somehow, I suspect Charles did it. Great pictures and the blog is top notch as always Charlotte. Kate is definitely not glowing today but she looks beautiful to me as ever. It's so nice to see that she maybe tired with two under two (although not for much longer) like any other mother might be. She looks like one would expect - tired, worn out, mother of two and completely human. I don't like the coat - as others said it looks like it should have gone on a couch and not on her. The hat is awkward as well. I think the color may also be contributing to the fact that she looks tired. What a great treat to see George twice at the event and love his genuine enthusiasm. He did so well to be so young. 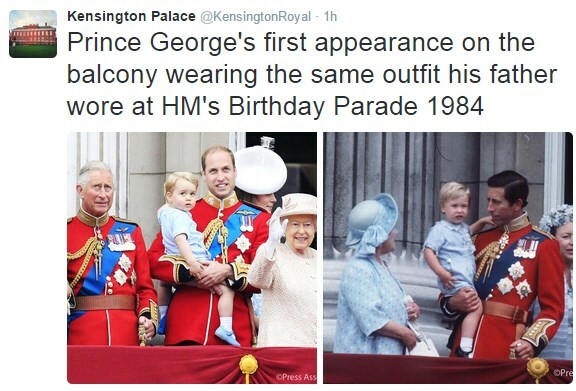 Love that they also dressed him in the same outfit as William. That was a lovely gesture. I also think that the line up on the balcony was deliberate to how the heirs in direct succession all placed together and to have George clearly visible to the crowd that was there watching. It was interesting to look at all the pictures of Kate from the past Trooping. My favorite still remains of her first appearance in that dream of a cream McQueen coat. So wonderful to see so many smiles on the royal family's faces. Babies can to that for a family. I pray they will have many happy times and more little ones to join the family. Prince George makes me think of a young Henry the eighth. He looks nothing like his father when he was a baby. The older lady at the window has been identified as Lady Diana Farnham, a lady in wsiting to the Queen. The second small child may be one of the tiny Kents, or possibly a Tindall, but I think Zara's child is more blond. When they first came out onto the balcony, George immediately pointed, and William then also pointed and said something to him. I wondered if they could see the London Eye from there; it seemed about the right direction. While it is great to finally see her out and about, I must say the whole look is a total fail for me; and that is honestly a first! The coat looked like an old lady coat and aged her way too much! The hat was too big, pretty, but accentuated her still rounder than normal pregnancy face (nothing wrong with her face! just the mixture of the two together); her hair was "off" as well, it looked course and not curled correctly, very blunt, course, and choppy. I thought she looked better after giving birth than today. Harsh words....I know...she still looks better than 99.9% of the population...so I'm only comparing her look today with her previous looks in the past. She will always be stunning...even in a paper bag! Catherine looks gorgeous and I love that shot of William holding his son he looks so handsome and it is so dear! Thank you Charlotte for another great post!